The ultimate hands-free beer hat! This black 'Beer Hunter' helmet answers two questions that have blighted beer-lovers for centuries: "How can I drink two beers at once? ", and "How can I do it without using my hands?" The answer to both of those questions is...buy a beer hat! 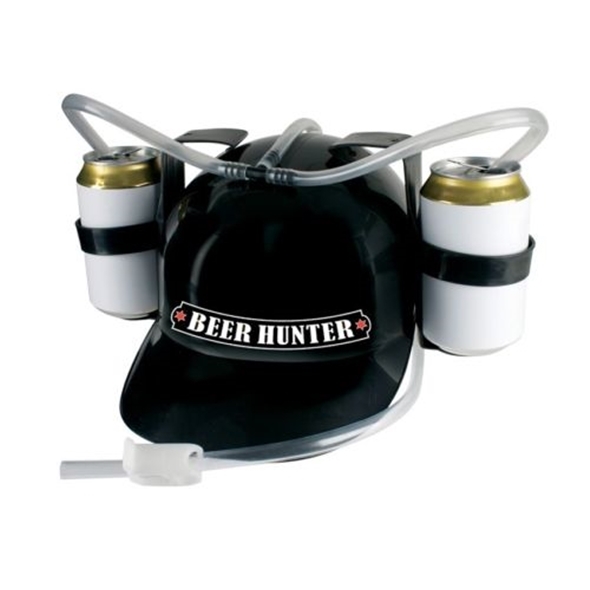 The 'Beer Hunter' drinking helmet can hold two cans at a time, and the ingenious head-to-mouth straw allows you to keep your hands free for channel-hopping, video-gaming, and other such noble pursuits. Whether you're watching TV, playing CoD, or just getting a little bit D&D, this brilliant beer hat is the companion you've always dreamed of. Not only does it allow you to chug two beers at once (meaning that you'll get drunk twice as fast), it also enables you to get drunk hands-free! The 'Beer Hunter' drinking helmet is perfect for intense gaming sessions and other occasions that demand total commitment from your hands. Keeping your cans in the beer hat will ensure that you can enjoy a bit of booze without having to pause the game every time you take a sip! This drinking helmet is the perfect gift for couch potatoes, avid gamers, and big-time boozers of all stripes. Add one to your basket now!